Global body rejects pro-whaling countries bid to have decades-old ban on commercial hunting overturned at Brazil summit. A Japan-led proposal to lift a 32-year ban on the commercial hunting of whales has been rejected by a global body for the conservation of the mammals. 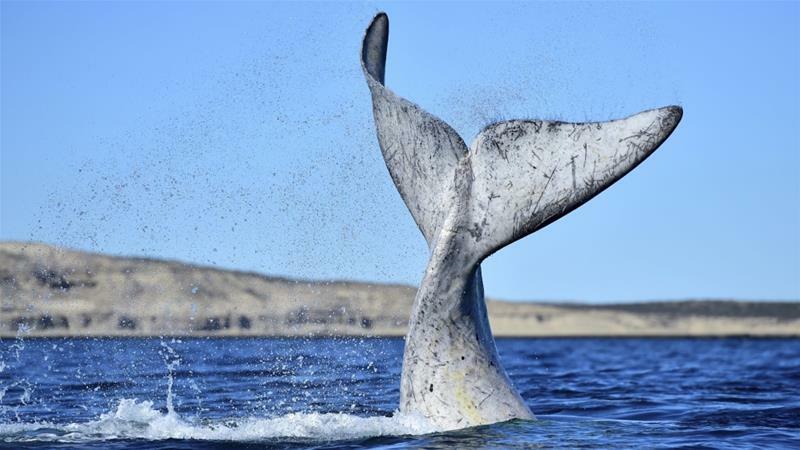 During a bi-annual summit in Brazil, member states of the International Whaling Commission (IWC) on Friday voted down the motion by 41 to 27. Two member states – Russia and South Korea – abstained, while one – Monaco – did not participate. 1) Whales eat kelp,krill and other small items of the sea. Confirmed: I have seen a beached whale full of plastic and Microscopic BPA plastic pollutes seas. 3) UNHEALTHY: So Whales meat is contaminated with BPA plastic: Weakens all parts of humans. P.S. I used to live in Nippon 1980-84 and know y’all are Tough & Loyal & Honest. The 3rd book I’m writing reveals the Secret Sumo Wrestlers aren’t fat but strong & tough Highlanders like Scottish men. I’ll add to the book I’m about to Publish “Japanese are Overwhelming Fools” and REMOVE Sumo Wrestlers are Strong as Scottish men. Also Hide Japanese Honesty & Loyalty.